Meanwhile, in the south of France, Saracens beat Narbonne 37-20, and came away with a bonus point to boot. 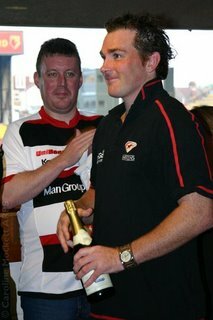 I wasn't able to attend that either, but I was keeping an eye on the game via the live updates webpage at saracens.com. 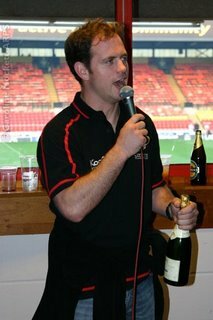 It was quite fun watching for something to appear on the screen and shouting at my monitor when we scored a try! 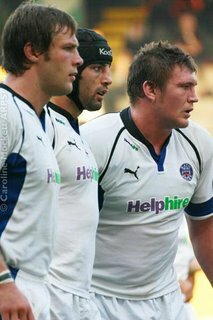 Neil de Kock scored two tries, Jackson went over once, and the forwards battered Narbonne into conceding a penalty try. All in all, a good evening! 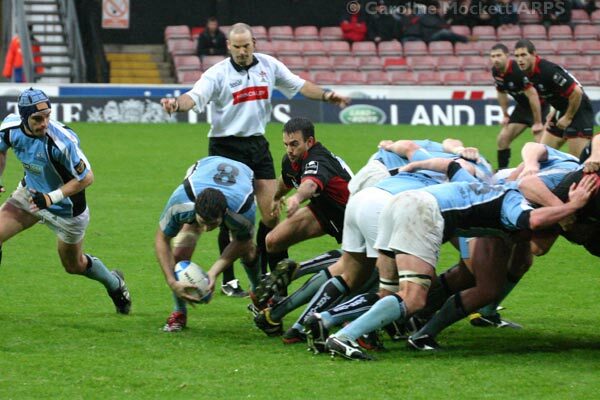 Here's a picture of Neil hounding the opposition scrum, from last week's defeat of Glasgow Rugby. But not such a good night for poor old Josh Lewsey, who twisted his knee during Wasps' defeat to Perpignan. Let's hope no more of the England boys go down with injuries before Andy Robinson has a chance to pick his team against the next week. I've got tickets, and I'm raring to go!! Backs: I Balshaw (Gloucester), O Morgan (Gloucester), J Lewsey (Wasps), M Cueto (Sale Sharks), P Sackey (Wasps), B Cohen (Northampton), M Tait (Newcastle), A Allen (Gloucester), J Noon (Newcastle), T Flood (Newcastle), C Hodgson (Sale Sharks), A Goode (Leicester), P Richards (Gloucester), S Perry (Bristol). Forwards: A Sheridan (Sale Sharks), P Freshwater (Perpignan), J White (Leicester), S Turner (Sale Sharks), G Chuter (Leicester), L Mears (Bath), B Kay (Leicester), D Grewcock (Bath), T Palmer (Wasps), C Jones (Sale Sharks), P Sanderson (Worcester), L Moody (Leicester), T Rees (Wasps), M Lund (Sale Sharks), M Corry (Leicester), J Forrester (Gloucester). Seems like a good mix of youth and experience. Let's hope they can bring it on when the Kiwis take the field. I wonder if we will agree! Unfortunately, Watford was deluged with heavy rain on Sunday, so the game between Saracens and Glasgow Warriors was a very wet affair. I felt really sorry for all the guys having to run around in such atrocious conditions. Thankfully, my bit of the stand was undercover, so I never got a soaking. Sarries were a bit crap during the first half, and went in at the break with fewer points than Glasgow. 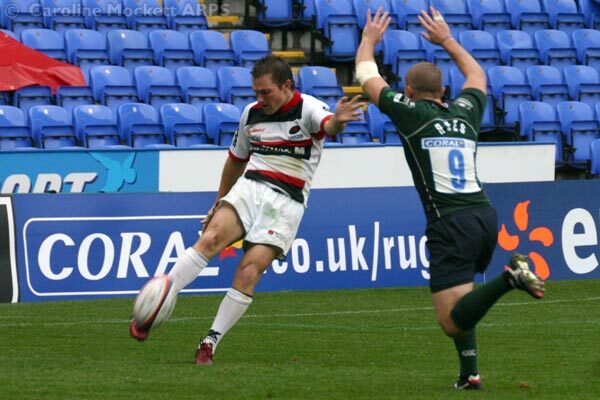 That game brings up the big 50 for rugbypix.com, the time has flown by since I went to my first game in February 2004! Let's hope next weekend's trip to Narbonne isn't as wet. Pity I won't be going along too, but I should be back watching England vs the All Blacks on 5th November. Saracens couldn't seem to get themselves together against Cardiff Blues. It was an EDF Energy [Anglo-Welsh] Cup Match and somehow, despite going in at half time up by 22-15, Saracens contrived to loose the match 29-40 by the time 80 minutes was up. They didn't have any sort of shape, and a couple of silly mistakes gifted the Blues scoring oppourtunities. All very frustrating. Still, my pictures weren't too bad. 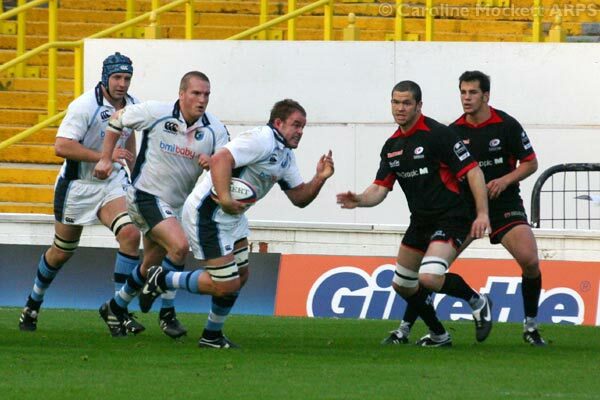 Here's the Blues' Captain Xavier Rush doing his stuff, with Andy Farrell on as a substitute for Sarries. Sarries ran riot against Bath, scoring SIX TRIES (yes, that's Six), and ending up on the right end of a 55-23 scoreline! How did they do that? Dunno, but I don't half wish they would do it more often! Bath's forwards are usually noted for their grunt, (left, three of the Big Bruisers line up for a scrum - Andy Beattie, Danny Grewcock and Peter Short) but this time round, they were being pushed all over the park. We had tries from Wingers, Centres, a rumbled-over drive by the forwards, and a great display of putting the opposition under pressure. Glen Jackson (man o' the match) scored 23 points on his own via the boot. Everyone looked cohesive and the Neil de Kock/Jackson combo seemed to work really well. Seymour was sniping round the fringes again and our lineout was solid. It means that, as of today, we're now 6th in the table (see below), but have scored the most points in the Premiership - 157 so far. Bristol (still top of the table) have scored just 136. However, they've only conceded 76 points, whereas Sarries have 111 against them. So it looks like we need to get working on our defence, since it's obvious we can score tries! Great stuff guys, let's see more of the same next week! We're hosting Glasgow Warriors for the first European Challenge Cup pool match this Sunday. It will be great if they can keep the momentum going. Finally, here's a couple of pictures from the Members' Bar after yesterday's match - former Saracen/England Scrum Half Kyran Bracken presents the Man of the Match Champers to Glen Jackson. Andy Farrell finally made his first start in Premiership Rugby Union at the weekend, in Saracens game against London Irish in the EDF Energy Cup (formerly Powergen Cup). Unfortunately, he didn't really set the park on fire - partly perhaps because of the heavy downpours which occurred during the game. Saracens lost 24-36, and never really looked like they were bossing the game. I wasn't too worried to begin with, as we scored a couple of penatlies, and even at 12-12, I thought we were still in with a chance. But then a couple of silly errors gifted Irish two tries (Richie Rees charged down a clearance kick by Glen Jackson (left) to put the ball down) and it all kind of slid away from them. I must admit that Dave Seymour looked far more lively when he came on as a replacement for Farrell in the second half - and made an immediate impact with sniping at rucks and making a couple of huge tackles. Obviously, it's early days for Andy, but I do hope he can get into his stride sooner rather than later. Meanwhile, boss Alan Gaffney insists Farrell should stay at Six. And Jeff Probyn wonders if it's too late to teach an old dog new tricks. Here's a picture of Farrell in Saracens' away colours, talking to Scrum Half Mosese Rauluni during one of the first scrums of the game. See more pictures from this game. 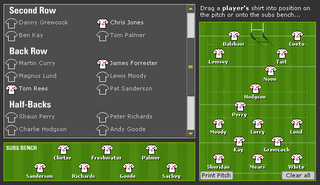 Sarries face Cardiff Blues next weekend in their next EDF Cup pool game. Scary, as the Blues stuffed Wasps this past weekend. We need to get the home crowd cheering the boys on!